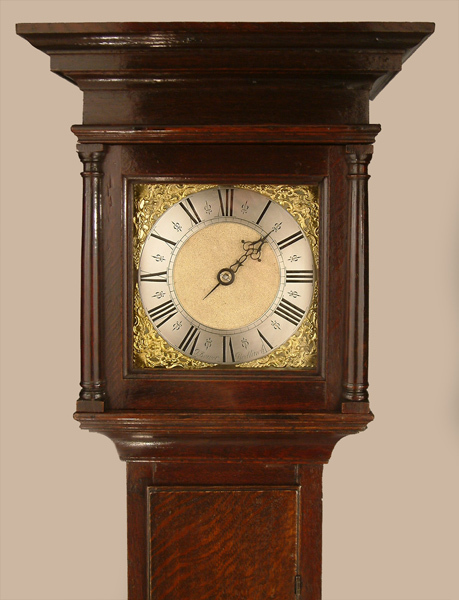 Peter Bower of Redlinch Longcase Oak Mid 18C - Height 71.7in. This Longcase Oak Archive's Maker - Peter Bower of Redlinch - also spelt Redlench and nowadays Redlynch is recorded "born 1715, married 1739 died 1795".Prolific and well respected maker of better quality clocks. A very good, small, flat top, quarter sawn oak case of pleasing proportions, colour and patination. The hood with "pillars attached" opening door, quarter columns to rear and the base set on shaped bracket feet. 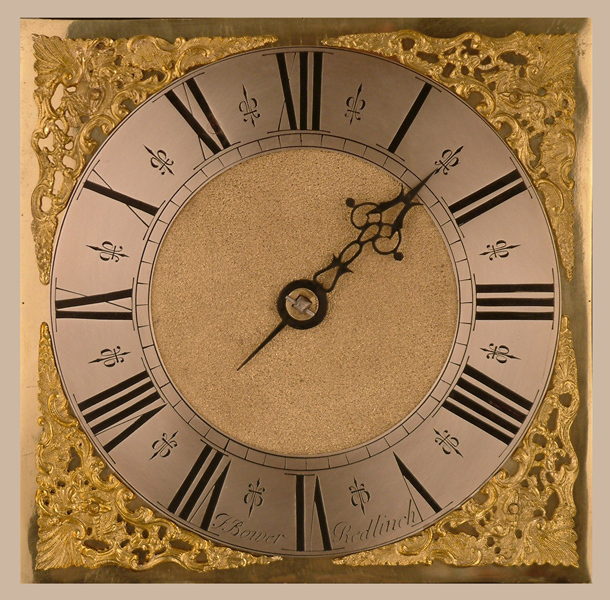 9" square brass dial ( 8.5" showing ) with very finely matted centre, raised chapter ring signed P.Bower Redlinch, rococo spandrels and blued cut steel single hand. Good quality "birdcage" movement having hourly ( countwheel ) striking on a single bell.This is a so called "30 hour" movement with a shorter than normal drop meaning that it would need to be wound ( the single weight pulled up ) both first thing in the morning and last thing at night to maintain working. Peter Bower of Redlinch - also spelt Redlench and nowadays Redlynch is recorded "born 1715, married 1739 died 1795".Prolific and well respected maker of better quality clocks.